Because there’s really nothing better, right? I mean, bacon might as well be the supreme food item on this planet. It’s perfect in every way. And I like to eat it. I’m assuming so do you. Today I am sharing my tips for perfect bacon. Yes, I realize it’s hard to improve on something that’s already perfect in its original, unadulterated form, but my bacon and eggs really are incredible. And you should make them at home. Like now. First, heat a panini or grill pan, preferably cast iron and incredibly heavy so that it will conduct the heat evenly. Get the pan nice and hot on a medium heat flame and place your thick slices of bacon on it. Thick bacon is better. Thin bacon is sad and upsetting. I feel like there are many parallels to life in this comparison. I digress. 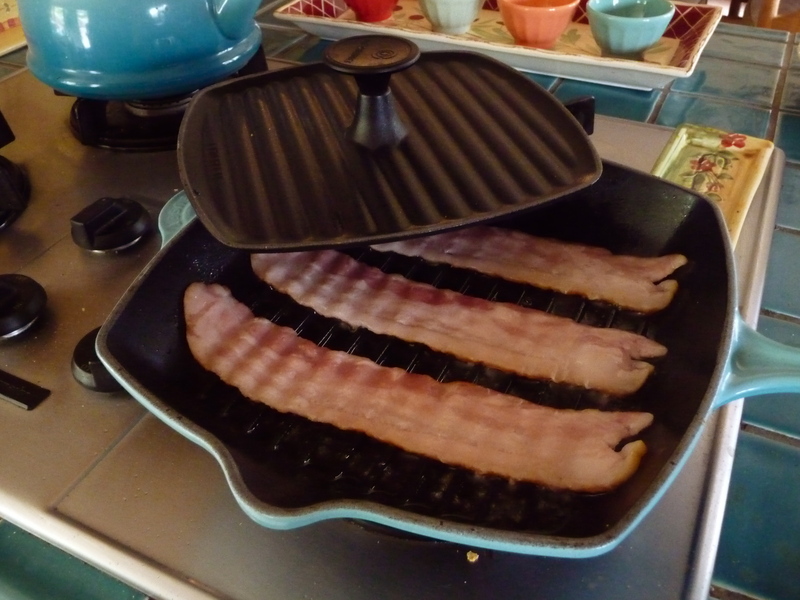 If you’re panini pan has a topper, meaning a heavy ridged lid, use it as it will press down on the bacon and create nice char marks on both sides. Because these are cast iron and heavy, the bacon cooks about twice as fast as a normal pan and renders out a lot of the fat. Now, I know what you’re thinking: why on earth would I want to get rid of the precious fat in my lovely, thick bacon? To crisp it up of course! A few thick pieces of bacon need only about 2-3 minutes on each side and they’ll have lovely grill marks when done. Because we’re using a ridged panini/grill pan, all of the oil melts out of the bacon into the ban, leaving us with deliciously crispy, less fatty bacon. So what will you do with all that yummy leftover bacon fat? Make eggs in it, of course! Continue on this fatty discourse of deliciousness after the jump. Pour your warm bacon fat into another, flat saucepan in which to cook your eggs. 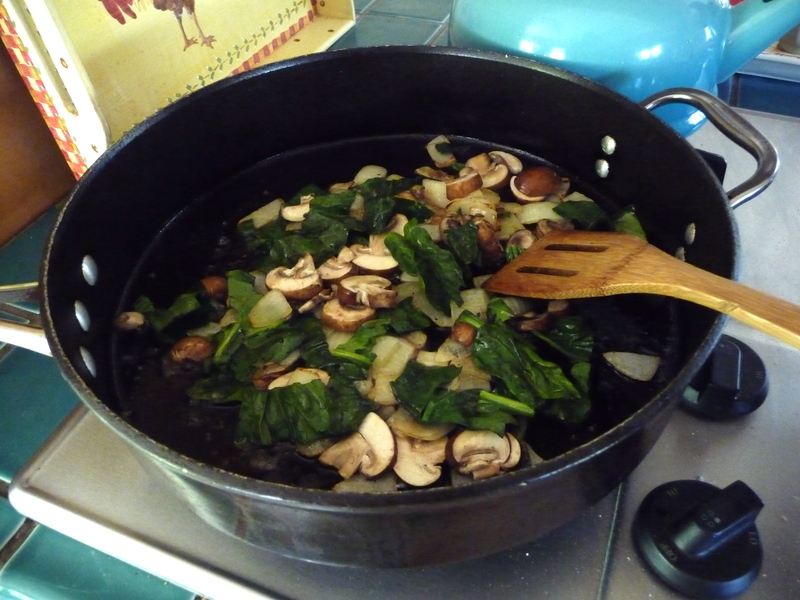 I happened to have some onions, mushrooms and greens on hand (you know, because we have to make this somewhat healthy) and sauteed them in the bacon fat. You’re mouth is watering. Don’t lie. I can see you through the screen! Saute the veggies until pretty much done, then create your egg well by pushing the veggies to the sides of the saute pan. Or in my case with this behemoth of a pan, it’s more like a wreath. A wreath o’ veggies. I should trademark that. 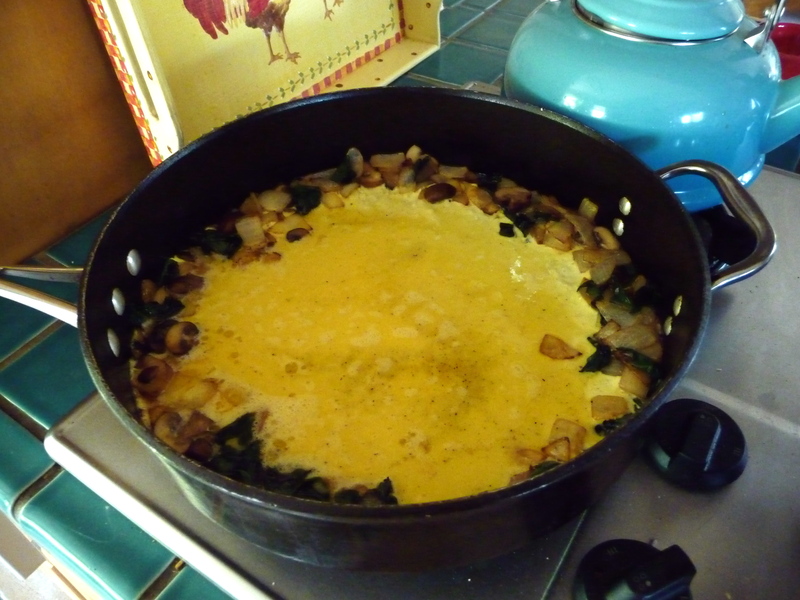 Pushing the veggies to the outer eggs, I pour in the eggs in the middle, then use a spatula to turn the veggies out over the top of the eggs, thus lifting the edges of the eggs and creating a nice little rounded, omelette-like creation. Remember – undercook your eggs, do no overcook! Less is more. Runny is good. Running is good too I assume. But why would I think about that when there’s bacon at hand. Once the eggs are cooked I imagine you should eat them. Along with the bacon. And prepare yourself for bacon breakfast overload. Because honestly, a meal only improves with the addition of pork products.